Standard bathroom scales are so last decade. The Withings Smart Body Analyzer WS-50 bring things into the modern. These digital scales can measure not only your weight, but also body fat percentage, heart rate, air quality, temperature and then send it all to a personal online account via Wi-Fi. How's that for futuristic? Only it's not for the future, it's in the here and now. There's often a question mark over whether digital scales can accurately and consistently deliver what they're designed for. We've been using the Withings smart scales for a few months in collaboration with the Withings Pulse activity tracker to see just how on the money it is. Speaking of which, the £130 price point is a fair whack of cash. 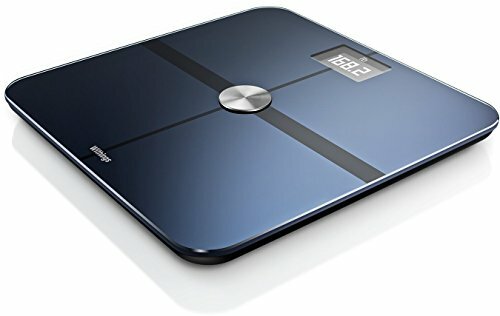 Can the Withings WS-50 deliver the goods and how does it weigh up compared to a standard set of bathroom scales? Straight out of the box the glass-topped Smart Body Analyzer looks the ticket. Pristine, shiny and without a footprint or toe hair yet in sight, it's an attractive, modern view of the contemporary bathroom. We like it. However it's a bit of a dust magnet and you'll find in no time at all that various specks will have gravitated and nestled down on the main panel. Not a huge problem to keep clean, but an aspect of the design nonetheless. If you have a hard floor then the standard feet on the base of the WS-50 work well, whereas if you have a carpet, rug or other soft flooring then there are additional feet included in the box that can be added to disperse the weight better. Being digital these scales obviously require power to perform and display info on the 128 x 64 resolution mono LCD. It's low res, but it doesn't matter as the information is bright and clear. Fortunately the power source is simple: included are four AAA batteries that deliver the juice and should last for many months or even a year even for regular weigh-ins. We've been stepping on and off these scales for months and have no complaints in the power department - none of this charge-up nonsense to be found here. So far, so easy. However, setting up the device feels as though there's an unnecessary hoop to jump through: Bluetooth. It's not complex, as such, but you need a Bluetooth connection to talk to your smartphone to activate the scales, but thereafter it's Wi-Fi all the way. Seems to marginalise those who don't own a Bluetooth smartphone. That might be a small number, but it's still a number. From here you'll want to set up an online Withings account to get the most from the scales. You don't have to, as they'll still work as standalone scales. But with an account the WS-50 will gather data, archive it and it just feels more personable too - each time you weigh in a three-figure name reference will appear on the device's screen to show it's identified you as you. It's even possible to register several family members to get the most out of your investment, so the individual recognition is an important element. You can display weight in pounds, stones or kilograms, and temperature in Celsius or Fahrenheit as you wish with a bit of menu prodding. Once it's set up how you like it, we doubt you'll ever change it. Whereas with the Withings Pulse activity tracker we felt as though it had a limited audience, the Withings Smart Body Analyzer WS-50 is an all together more rounded device. You might just want to know weight, you might want to know a lot more - and the WS-50 has got the depth to cater for all, however advanced you are. It works very precisely too, down to one tenth of a pound at best, far better than the nearest competitor that springs to mind, the FitBit Aria scale. The main reason for the Withings superiority comes with its accuracy. We did weigh-ins in quick succession and they were always identical, and that counts whether checking on hard or soft flooring. We even checked it with some 5kg weights and the WS-50's readings were always spot on. Our first real complaint, however, is that some reads can be a bit hit and miss. Heart rate, for example, won't always work. Neither will the air quality - assuming you can decipher what it's telling you about CO2 content. Then there are the more detailed reads, such as body fat. It's well worth knowing as BMI (body mass index) calculated by the bog-standard height and weight chart would make a pro bodybuilder "obese" by default. Not so when an electrical measure is used to identify the stuff you're made of. Good though it is, you'll need to be critical about when you weigh in. Go on a week-by-week basis at a similar time for the most accurate read. Don't do it after a night at the pub, or after strenuous activity when you're dehydrated as the results can be misrepresentative due to water content. You can throw out the read by quickly drinking a litre of water, for example, as we found out when trying to fool the system. And we did get some inaccurate reads telling us we had just over 14 per cent body fat when we know that's a big fat lie. A kind lie, however. But like any reluctant, self respecting person we won't bore you with the details of exactly how much of the real figure is. Needless to say, the WS-50 makes us want to rid more of that bad stuff than before we started to use it. It's a device that adds drive. The WS-50 isn't locked down to just the bathroom. Well, physically it might be, but accessibility of its data via online or app-based means is one of its strongest points. Used in combination with the MyFitnessPal calorie counter and the Pulse activity tracker and the abundance of data is automatically pinged on over to your smart device app via Wi-Fi. Clear, colourful visuals on screen and the ability to set goals and view your data over several days, weeks or months looks great and is genuinely useful. The website display is customisable too - add in measurements, take panels away or click and drag them around the page. Very cool. You can see correlations between activities and weight over time. Keep that monitoring up - which is easy, as it's a step-on, step-off experience - and you'll have a catalogue of data to show that you're heading in the direction you want to be. The Withings Smart Body Analyzer WS-50 not only looks cool, it's accurate and will benefit anyone at any level. Whether you just want to know your weight, or get more advanced with the full spectrum of reads that these scales are capable of then the WS-50 doesn't disappoint. Add it in to the wider Withings ecosystem and it becomes yet stronger. Accuracy was our primary concern but the WS-50 passed this test with flying colours. Yes, you can confuse its body fat percentage readings if you try - glug water, take measurements after perspiring excessively and so forth - but just don't try to and there's no real problem to be had here. The fact they're pricey and there's the occasional blip in some reads does sees the WS-50 fall shy of a perfect score, but it's off on the right foot; Withings is onto a winner here. If you don't want all the extras that the WS-50 caters for then this might not be a best buy for your personal needs. If, however, you're embarking on weight-loss, weight-gain, training or just want to keep an eye on where you're at with a multitude of data then, simply put, we can't think of a better set of digital scales.